Olives are such an important crop to the Mediterranean region that the tree is mentioned throughout literature from the region that ranges from Ancient Greek legends to the Bible. In the United States, olive trees cannot grow north of Zone 8, due to their lack of cold-tolerance. Olive trees will suffer damage if temperatures drop below 17 degrees Fahrenheit and will die to the ground if exposed to temperatures colder than 12 degrees Fahrenheit. This means that in Georgia, olives can only grow well in the southern portion. Consult a USDA hardiness map to determine which hardiness zone you are in. In Georgia, only zone 8B remains warm enough year round to grow olive trees. Propagate olive trees from cuttings. Olives can grow from the seed found in the center of an olive fruit, but most olive fruits sold commercially are from hybrid plants. 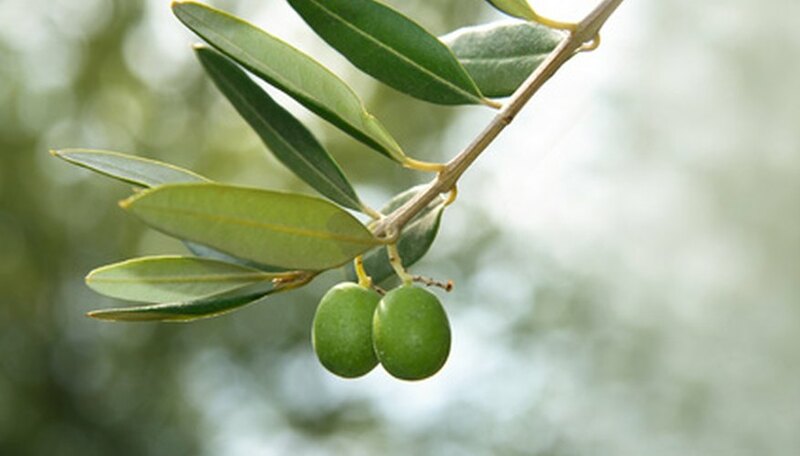 The seed of these plants will not produce an olive tree that is similar to the parent tree. Instead take a 6-inch cutting from the end of an olive branch near a point where leaves emerge. Dip this cutting in rooting hormone, remove the lower two-thirds of the leaves and place the cutting in a 4 -nch wide container of potting soil. The stem will develop roots within six to eight weeks. Select a location for your olive tree that receives full sun and good drainage. Test your soil with a home pH testing kit. You can find such kits in your local garden center. Olives are a adapted to a wide range of soil including Georgia clay, but require a pH between 5.5 and 8.5. Break up the ground in the area where you will grow your olive tree using a rototiller. Spread organic material such as compost, manure and peat moss over the soil to improve drainage and nutrient content of the soil, as well as sulfur to raise the pH of your soil or lime to lower the pH over the soil to a depth of 4-inches. Mix these amendments into the soil with the rototiller. Amend a wide area of your soil instead of just your olive’s planting hole to encourage good root development. Dig a hole for your tree that is twice as wide as the root system, but no deeper. Place the tree in the hole, and cover with soil. Pat the soil to remove air pockets. Mound mulch up around the trunk as deep as 1-1/2 feet through the tree’s first fiveyears to avoid freezing damage. Prune trees yearly in spring. The trees should be trained so that they have three to four main branches that begin at 3 feet in height and support the canopy. Fertilize with between 1-1/2 and 2 lbs. of nitrogen fertilizer (10-0-0) yearly. Water your olive tree with 1 inch of water every 10 days. Olive trees are drought tolerant, but grow better with ample water. Do not let your tree become waterlogged. For a more accurate pH test, have your soil tested by the University of Georgia Agricultural and Environmental Sciences Lab. You can submit a sample of soil for testing through your local Georgia County Extension Service office. United States Department of Agriculture: Why are Georgia Soils Red?